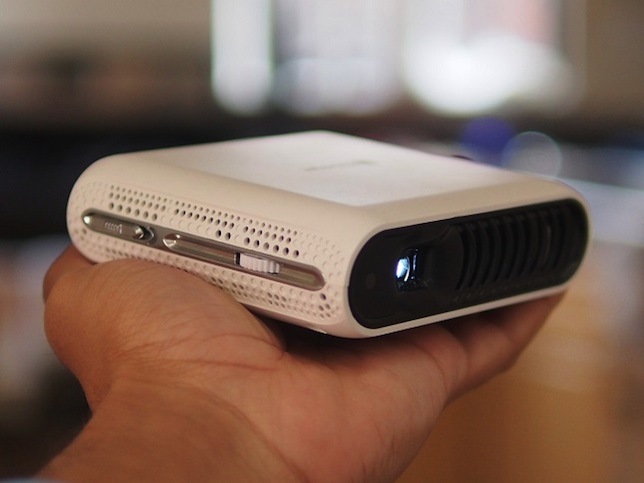 A start-up that last year used crowdsourcing to raise $800,000 has introduced a new projector that weighs just 9 ounces, can fit in the palm of your hand and offers images that can be projected on any surface. Touchjet, founded in 2013, has released its first product, the Touchjet Pond Projector (formerly known as the Touchpico), an ultra-portable projector that can display images as wide as 80 inches on any surface, allowing teachers and students to interact directly with photos, videos, games and presentations. Built on the Android 4.4 operating system, the Pond Projector gives users access to hundreds of thousands of apps that can be downloaded directly to the device via Google Play. It has an 80 lumen LED lamp and a built-in infrared sensor that allows it to track two bundled infrared styluses, which are powered by two AA batteries. It comes with the two styluses and a Bluetooth remote control that can also be used as an infrared mouse. Touchjet representatives said the Pond Projector is intended to act as a counter balance to the one-on-one movement in which students work on individual devices as opposed to together as a group. "Some curriculum is best taught through individual learning, but other subjects require collaboration so students learn together while improving their social skills," said Touchjet Educational Specialist Holly De Leon. "We believe there needs to be a balance, so educators don't sacrifice opportunities for collaboration and group learning." The Pond Projector was introduced during the ISTE 2015 conference June 28-July 1 in Philadelphia.